With the new announcement that Dominoes are creating a car that contains ovens to cook your pizzas on the move, Pizza Hut are in need to step their game up and compete against the pizza revolution! Let’s just say they have created a very strong contender which will get your tummy rumbling and mouth watering! 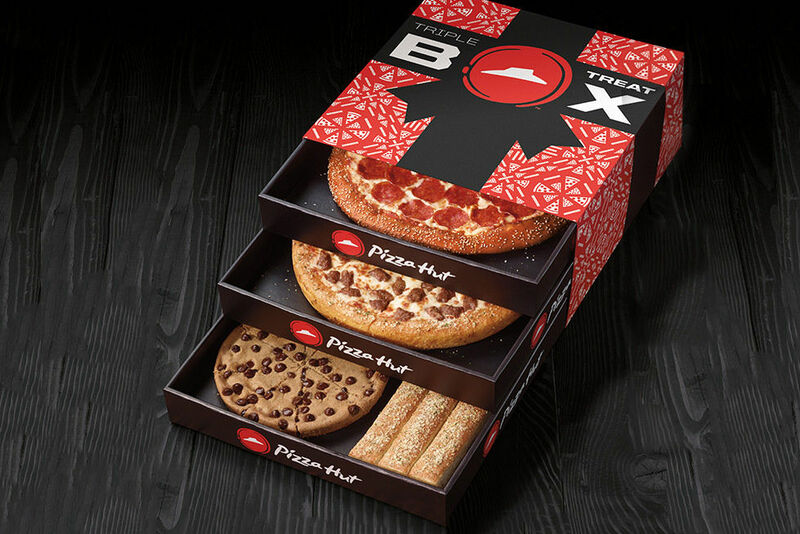 Its fair to say Pizza Hut have never been shy of a big idea with some big calories to come with, with their burger or hot dog crusted pizzas, but this idea just steps it up to the next level! 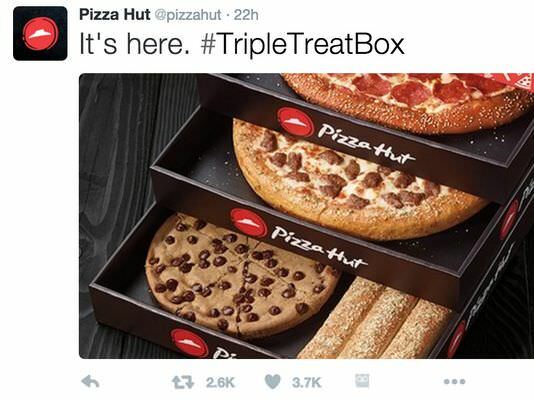 Pizza Hut have named this beautiful creation the Triple Treat Box, and this really does not lie when it states it’s a treat! This takes pizza boxes to a new level and we’re not sure why this has not happened sooner! The boxes consist of a three-tiered level layout with a tasty course of a meal in each drawer. The top two layers consist of a medium pizza on each level, with the bottom layer being the dessert drawer hosting a giant chocolate chip cookie – yum! That’s not all, if you’re still hungry for me, you can opt for bread sticks or flavoured sticks to squeeze in with the giant cookie. This ingenious idea was first developed and tested in the Middle Eastern Pizza Hut branch where the Triple Treat Box took off and was absolutely loved. Since then, you’ll be happy to hear, this delicious pizza three tiered box is headed to the States for us to all tuck into! This tasty box will cost just $19.99 (plus tax and delivery charges) which is an absolute steal for this grand three-course meal! This amazing three tiered boxed pizza answers so many people’s regular pizza dilemmas, should I have a simple cheese and tomato or maybe a meat feast? 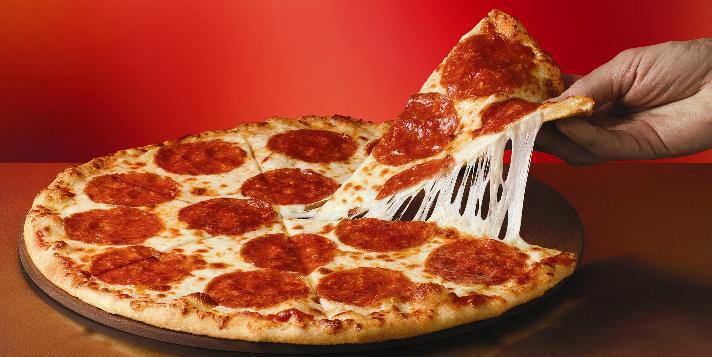 Perhaps a pepperoni or make it attempt to be healthy with a veggie topped pizza. But now you no longer have to just choose one with two medium pizzas to tuck into! Question is, will you be able to share this delight or keep it all to yourself? Either way, this is the perfect meal for a Netflix and pizza night, so cancel all those weekend plans and get the Pizza Hut menu loading! The 10 Highest Grossing Live Tours Of All Time – #3 was Amazing! From 360 degree stages and hovering screens to 2 million people on one beach, here are the 10 highest grossing live tours of all time. You wouldn't know if there was a real zombie in that movie, would you? Check out for these signs in your daily routine as you might have a serious health condition. Tattoos can mean different things to different people, whether it is a fashion statement or something meaningful the fact of the matter is it is a huge commitment that we all hope we own't one day wake up and regret! 11 Things Only The Oldest Sibling Knows To Be True – #7 Annoys Me!